I tried something new a few weeks ago and it worked! I loaded a brush with acrylic craft paint and splattered it all over mixed media paper in lots of different directions. When the paint dried I added watercolor flowers. 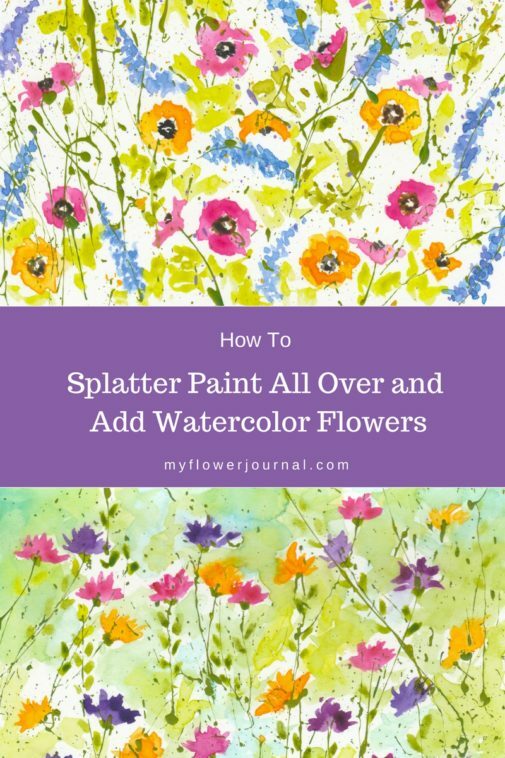 I love this new way to create splattered paint flower art! 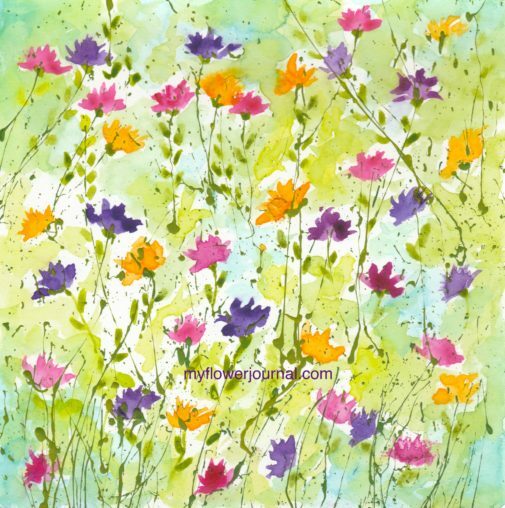 It has so many possibilities and it doesn’t matter if you have long paint splatters or little specks. It all works! 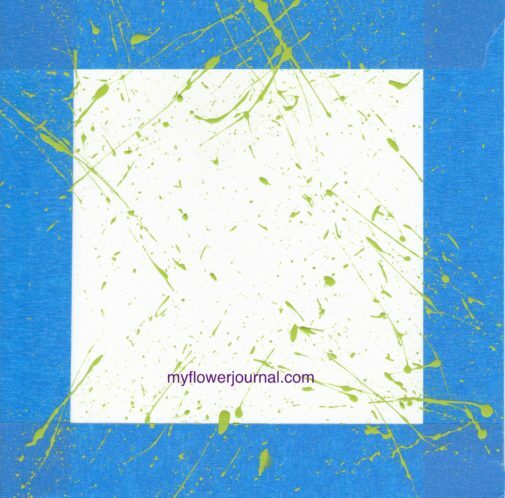 Start with piece of mixed media or watercolor paper . You can add masking tape or blue painters tape if you like a nice white border for your finished art. Next splatter acrylic paint in lots of different directions. You can learn more about my splattered paint art, the brush I use and watch of short video of me splattering paint here. After the acrylic paint dries its time to have fun and start adding flowers. You can pull ideas from your head or look at photos to get started. I have nice collection of flower photos from vacations and outings close to home I often refer to. I like to use Daniel Smith Watercolors or this Koi set by Sakura. Keep adding flowers and leaves until you feel like your flower art is finished. Why I Love Paint Splatters! Sometimes when I look at a piece of blank watercolor paper I can’t decide where to start or what to paint. Acrylic paint splatters give me something to start with. 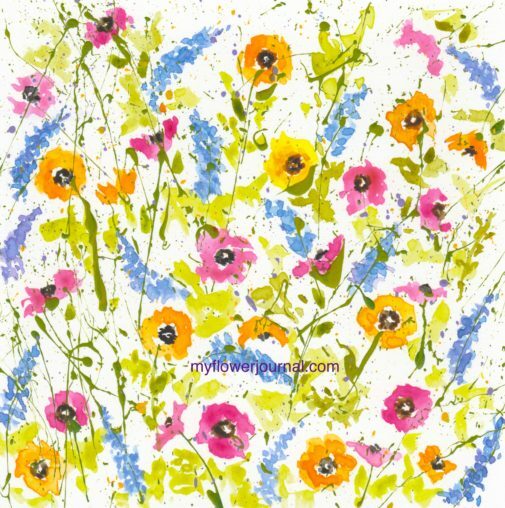 It also helps me to let go and be creative filling the spaces between the splatters with flowers and color. On this last design I got brave at the end and filled in around the flowers with some color! If you do add color to the background make sure the flowers are dry so the color doesn’t bleed. I love, love, love this ! I’m going to give it a try ! Thank you for sharing !! Thanks Nancy!I would love to see your art when you give it a try.